SewWonderful: August OMG: No Peeking! With the due dates of two exchanges looming in the near future, I have 6 mug mats that have been in various stages of completion for several months. The first set is due out at the end of the month but they have been ready to go since I offered to host the exchange. The other 4 are waiting for finishing touches. Since I can't reveal them until the end of September, I must commit to another goal that will be easy to accomplish in the busy days ahead and something that I can allow the blog peeps to view. A recent family trip to the beach produced an acquisition that is a temptation, a kit for the quilt, Cascading Cubes, from Center Diamond quilt shop in Cannon Beach. Cascading Cubes will become a baby quilt with the last 2 rows on the back for a smaller and more manageable size for both the new mother and baby. I don't need to start it until after Christmas so what else is there? 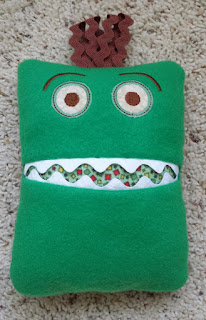 I almost forgot, the other two grands saw the tooth monster pocket pillow I made for the youngest and now they need one as well. How could I not make two more of this adorable creature? The embroidery machine will not be idle this month. Yes, I understand. Lots of deadlines by the end of this month, and next month. I started, but, then stopped. Time to get back to them, and get them finished. Too cute. That's the same look I get on my face when I step on the scale....giggle. 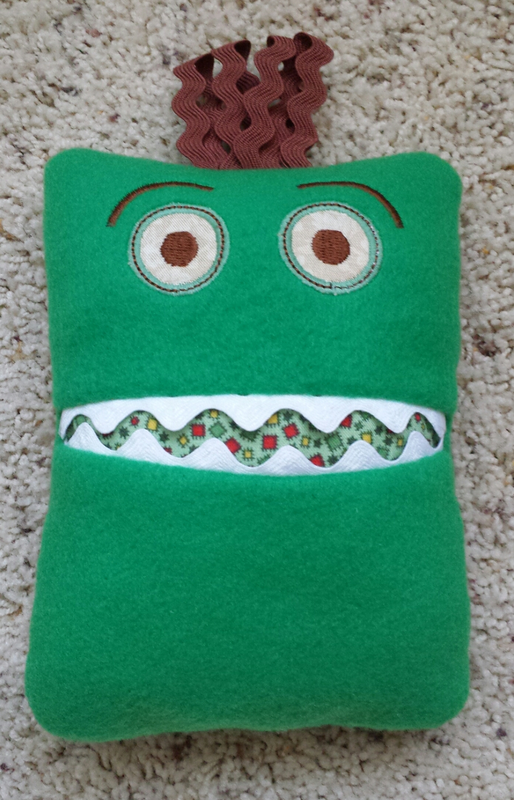 Cute little monster tooth pillow! Love it! Love the tooth monster. Thanks for linking up with Elm Street Quilts One Monthly Goal and good luck on your project.